Burying a Saint Joseph in your yard is a traditional way to try and sell your house. 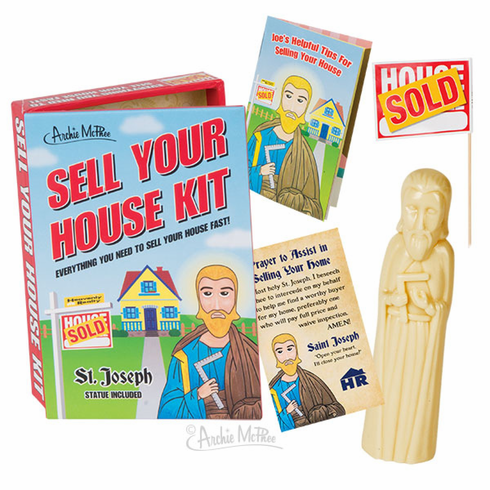 This kit contains not only a 3-3/4" (9.5 cm) Saint Joseph figure with a prayer on the back of his business card, but also a 16-page booklet of helpful (funny) house-selling hints and miniature for sale and sold signs. Comes in a 5" x 3-1/2" x 1" (12.7 cm x 8.9 cm x 2.5 cm) decorated cardboard box. Shrink wrapped.